Hong Kong, China (CNN) -- Hong Kong Island's neon-lit metropolis of steel and glass towers is abruptly contained by sheer, verdant hills which offer an immediate refuge from the madding crowds below. Peculiar to this condensed island city, you can be dodging rush hour traffic one hour and strolling beside a murmuring brook the next, with soothing birdsong and floral scents permeating the air in place of blaring horns and traffic fumes. One easily accessible route of escape from the frenetic city is the Morning Trail, which winds around Victoria Peak and passes through Lung Fu Shan Country Park. If you choose the downhill walk, the 2.8 kilometer trail begins near the Peak Tramway upper station on "the Peak" and winds down between unpopulated hillsides to the city's outskirts. The Peak Tram, running since 1888 along a steep funicular railway, provides a convenient means of reaching the trail from the heart of the city. From the Peak Tram's upper station, one has an astonishing panoramic view of the city below and the Kowloon Peninsular on the opposite side of Victoria Harbour. A short stroll along the precipitous Lugard Road, which winds around Victoria Peak from the tram terminus, is rewarded with unobstructed views of the harbor. As well as the serenity Victoria Peak bestows, the microclimate of its high elevation is degrees cooler than the heat sink of the concrete jungle below during the hot and humid summer months. 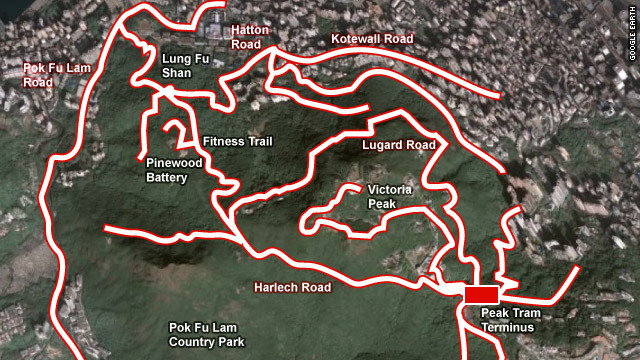 The Morning Trail skirts Victoria Peak via Harlech Road, which passes moss-lined slopes and a calming waterfall, with impressive views of Lamma Island and Pok Fu Lam Reservoir below. Turning off Harlech Road, the route descends down the Hatton Road fitness trail, which passes by creaking bamboo thickets, colorful wildflowers, fluttering butterflies and, in the warmer season, giant Golden Orb Weaver spiders poised in enormous webs among the foliage. The Orb Weavers are conspicuous with their black and yellow markings and equally intimidating dimensions -- growing to as large as a man's hand. A short diversion on the left of the trail half way down takes you to the disused Pinewood Battery. The battery was constructed during British colonial rule in 1903, with two six-inch guns installed for the defense of the harbor. The guns, later considered redundant, were removed in 1913 and the site was converted for anti-aircraft defense in the mid-1920s. In 1941, the invading Japanese Army carried out extensive assaults on Hong Kong Island and the battery was severely damaged in air attacks and subsequently abandoned. Shrapnel scars on the remaining dilapidated structures attest to the deadly rain of bombs. Magazine buildings, camouflaged structures and concrete gun emplacements cover the site, which was turned into a tranquil picnic area after the war. Moving down past Pinewood Battery, with more elevated views of the city, you can follow the trail to a junction and continue along Hatton Road to the base of the hill, from where you can walk or take transport back to the city. An alternative route takes you past Lung Fu Shan peak, which you can scale via a stairway to reach a pagoda overlooking the harbor. Moving along past Lung Fu Shan peak, the bitumen path reaches a narrow track which winds through densely wooded hillsides, alive with the sounds of flitting birds, to a stairway which accesses a main road leading back to the city. Take the Peak Tram funicular railway in Hong Kong Island's Central District from the lower terminus station on Garden Road (near St. John's Cathedral) to the upper terminus on Victoria Peak. As you exit the station, turn right and walk along Peak Road until you reach an intersection and turn left along the flat Harlech Road. Proceed until you reach an intersection and follow the sign pointing right down Hatton Road. Follow this winding path, passing Pinewood Battery on the left, to reach a junction. Continue down Hatton Road (turn right at junction) to reach Kotewall Road, from where you can return to the city. Alternatively, at the junction, continue straight ahead and follow the bitumen path past Lung Fu Shan peak on the right to connect with a narrow track that reaches a concrete stairway accessing Pok Fu Lam Road. From here you can catch a bus back to Central.